It's not quite like ice cream, nor in the same class as frozen yogurt. The closest comparison might be shaved ice, but a similarity in texture and flavor isn't found there either. Snow fluff — also called snow ice or shaved snow — is a dessert trend with Asian origins that's now made its way from down in Southern California up to the Inland Northwest with the arrival of 40 Below in the Five Mile Shopping Center. Owner Charlie Greer, who debuted the business in mid-December, became obsessed with snow fluff after trying it for the first time while visiting family in the Los Angeles area more than a year ago. "It's all I could talk about for months after I got home," Greer recalls. "So we set out to figure out how to Americanize it. Ours isn't traditional snow fluff that you'd find at Asian food places, which is often flavored more with bean curd and things." It's not ice cream, it's not froyo — so what is snow fluff? Greer says there are many types of ingredients used to make the lightweight, creamy treat. 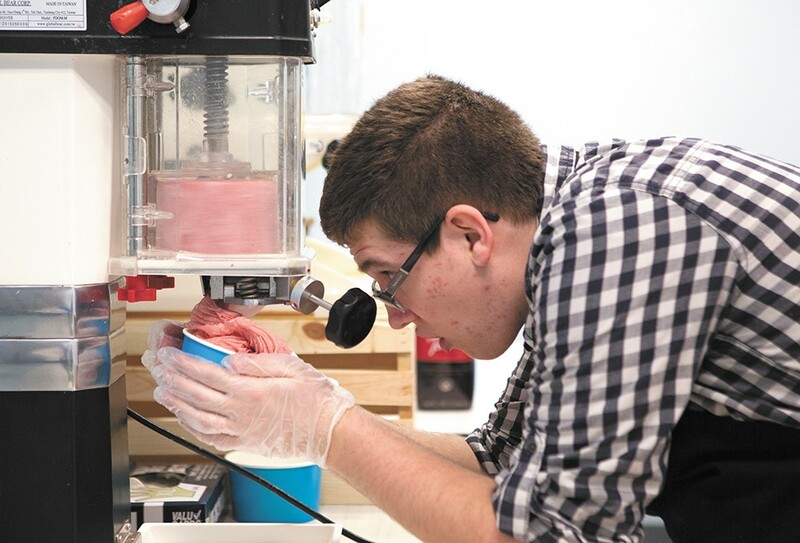 A special machine used just to make snow fluff freshly shaves the layered, frozen delight into a customer's cup. At 40 Below, it's made using frozen hemp milk. 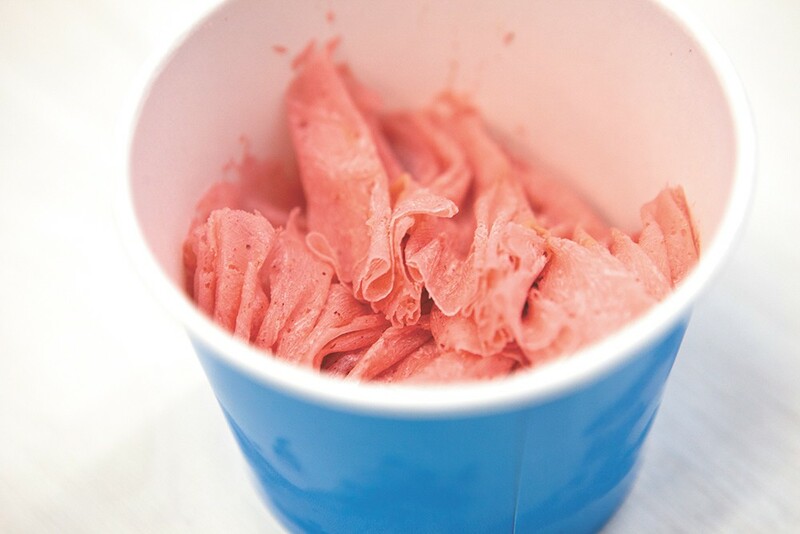 Its texture is lighter on the tongue than ice cream, but still sweet and creamy. 40 Below's Noah Preedy serves the dessert made with hemp milk. Other snow fluff vendors may use dairy or soy milk. After trying several types, Greer found the best results with hemp milk, which he then flavors with real ingredients rather than artificial powders. Those flavors are mixed in before freezing the milk at negative 40 degrees, hence the business name. "Literally, whatever flavor you pick, that's what it is, that's what we mix in," Greer says. "We purée our own fruits; if it's coffee, we cold-brew it in the back." Greer also asserts that his snow fluff is low in sugar content and somewhere between 40 and 90 calories per standard serving, depending on the flavor. Customers can choose from a variety of toppings, like fresh fruit and cookie crumbles, along with drizzled syrups. If 40 Below's snow fluff sounds too chilly, on the other end of the sweets spectrum the shop also serves hot chocolate, with more than 20 flavors to choose from. "The idea is that everyone does flavored coffee, and no one does that with hot chocolate," Greer says. "You can get a peppermint- or hazelnut-flavored hot chocolate, but we went and said, 'Well, I wonder how many flavors we can do?'" Popular combinations are cheesecake with berry syrups and orange habanero.